Sponsored by the St. Louis Fed. For college students. The National Research Council has released updated rankings of PhD graduate programs. You can find the ranking of economics departments here. Friedrich Hayek, The Fatal Conceit: "The curious task of economics is to demonstrate to men how little they really know about what they imagine they can design." Bill Clinton, 9/21: "Do you know how many political and economic decisions are made in this world by people who don't know what in the living daylights they are talking about?" 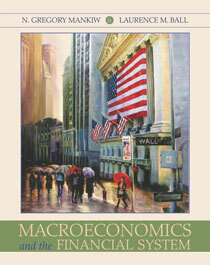 I have a new intermediate macroeconomics textbook coming out. Coauthored with my old friend Larry Ball, it is aimed at those instructors who want to include more material on the financial system than is traditional in macro courses. Click here for more information, and click here to read a sample chapter. The book is being printed now and will be available for next semester's classes. A reader points out to me that Sporting News has named the 20 smartest athletes in sports. Two of them are graduates of the Harvard economics department. The media is saying that Larry is leaving the White House in part because his leave from Harvard is almost up and if he stayed away longer, he'd have to reapply for tenure. From your own experience, is that probably true? I thought universities routinely relaxed such policies for star academics like you and Larry. Also, how prestigious is it to be a university professor? Also, being a university professor is quite a good deal. Top pay with maximum flexibility regarding teaching etc. As I understand it, you do pretty much whatever you want. Would Larry have been rehired by Harvard if he resigned and stayed another couple of years in Washington? Unclear. The pro case for rehiring would be that Larry is one of the smartest guys around and has a great deal of fascinating experience to share with students. The con case would be that he has been out of the academic research game for quite a while and that in a time of reduced financial resources, faculty slots should be devoted to younger scholars rather than potentially extinct volcanoes. Ironically, if Larry were on the faculty voting on this matter, the con case is the kind of argument he might have made. So, while I am sure that Larry's decision had various inputs, Harvard's leave policy was very plausibly one of them. I can also say that ec 10 students will likely be among the beneficiaries of Larry's return. Larry was a regular guest lecturer in the course, and his lectures were always well received. 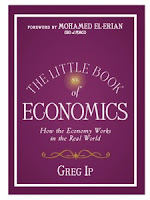 He does a great job illustrating the connections between economic theory and economic reality. The good folk at Thomson-Reuters have updated their list of Citation Laureates, which they believe is a good predictor of future Nobel Prizes. Closely related: the REPEC ranking of most cited economists. FYI, the economics prize will be announced on October 11. In a couple weeks, a movie called Inside Job will be coming to a big screen near you. Apparently, several prominent members of the economics profession play leading roles. Click here for the trailer and some clips. Nick Rowe is a convert to Chapter One. 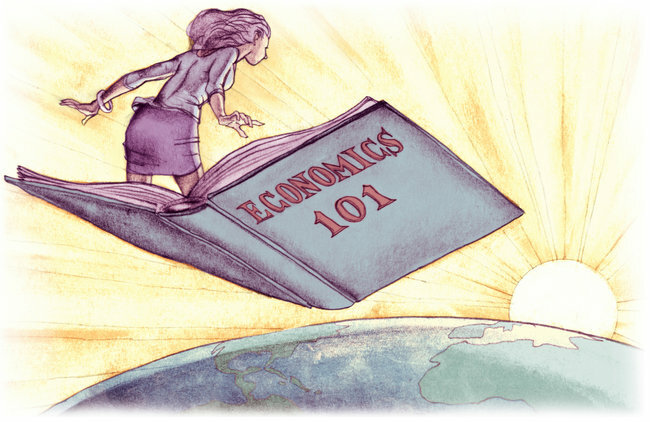 Many instructors in introductory economics like to use classroom games as a teaching tool. If you are one of them, you will find this resource useful. How much would the President raise the top tax rate? In 2010, the top income tax rate bracket for ordinary income is 35 percent. Besides wages and interest income, this income category includes profits from pass-through business firms—sole proprietorships, partnerships, and S-corporations. Under the president’s proposal, the top bracket will rise to 39.6 percent. A stealth provision that phases out high-income taxpayers’ itemized deductions will also be reinstated, adding another 1.2 percentage points to the effective tax rate, bringing it to 40.8 percent. Wages and some of the pass-through income will also remain subject to a 2.9 percent Medicare tax. These 40.8 and 43.7 percent tax rates, which will apply in 2011 and 2012, match the 1994 to 2000 rates—the same top bracket, stealth provision, and Medicare tax were in place then. But the picture changes in 2013. Under the healthcare law adopted in March, the Medicare tax will rise that year, from 2.9 to 3.8 percent. Also, a new 3.8 percent tax, called the Unearned Income Medicare Contribution (UIMC), will be imposed on high-income taxpayers’ interest income and most of their pass-through business income that’s not subject to Medicare tax. So, under the president’s proposal, virtually all of top earners’ ordinary income will be taxed at 44.6 percent, starting in 2013. Take into account state income taxes, and the top rate will be about 50 percent. I will be speaking at the Sixth Annual Economics Teaching Conference in Memphis, Tennessee, on Oct 21-22. If you are potentially interested in attending, click here for information. Alan says supporters of the Bush tax cuts have neglected the best arguments. 1. The university buys a rent-controlled building. The purchase price is low, because the existing landlord cannot make much money renting it. 2. The university then rents the apartments to its own senior faculty, who view this as a great perk. In essence, the difference between the free-market rent and the controlled rent is a form of compensation for the professor. As a result, the university can reduce the professor's cash compensation by an equivalent amount. The university is effectively earning the market rent for the apartment. 3. But it gets even better. The implicit rental subsidy is a form of non-taxed compensation. Normally, if an employer gives an employee a perk like this, the subsidy is taxable income (unless the perk is deemed a working condition required to do the job, like a hotel manager living in a hotel). But here, the university can claim there is no subsidy: It is only charging what the rent-control law requires. Because of this tax treatment, the implicit subsidy is worth even more to the professor than the equivalent cash compensation. This fact allows the university to reduce the professor's cash compensation by an even greater amount. Thus, the university effectively earns even more than the free-market rent on a real estate investment purchased much lower than the free-market price would have been. In the end, the goal of the rent control laws is thwarted (the low rents are enjoyed by well-paid tenured faculty rather than the needy), the income tax laws are thwarted (a sizable part of compensation is untaxed), and all this is done by a nonprofit institution (the university) whose ostensible purpose is to serve the public interest. Austan Goolsbee is going to become the next chairman of the Council of Economic Advisers. A fine choice. 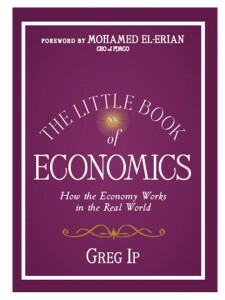 Greg Ip's new book, The Little Book of Economics, provides a nice, brief overview of the field, with a an emphasis on macro topics. The Obama administration is now proposing that businesses be allowed to expense investment expenditures. That is, for purposes of calculating taxable income, businesses would be able to fully and immediately deduct the cost of equipment, rather than having to gradually deduct the cost via depreciation allowances. This is a good idea. People are feeling poorer and more uncertain about the future. The rational response is greater saving. The trick to restoring aggregate demand and full employment is to channel that saving into investment. Normally, the Fed can help by lowering interest rates. But with interest rates at the zero lower bound, that option is not available. Tax incentives for investment can help achieve what monetary policy would if it could. However, the impact will be relatively modest. Notice that expensing merely accelerates deductions. Thus, the value to the firm depends on interest rates. With interest rates near zero, the impetus to investment is small. Put another way, this policy can be seen as giving firms a zero-interest loan if they invest in equipment. But with interest rates near zero anyway, the value of the loan is not that great. One can imagine more aggressive policies along similar lines, such as an investment tax credit together with expensing. But let's not make the best the enemy of the good. This policy proposal is a step in the right direction. I hope Congress passes it quickly and in a bipartisan fashion. Ben offers some very readable testimony on the causes of the financial crisis. Should the Bush tax cuts be extended? 70 percent said that all the tax cuts should be extended. In fact, the sound bite about 3% of small businesses, which has been picked up by numerous pundits, is one of the more misleading statements in the long history of economic propaganda. The 3% figure, which is computed from IRS data, is based on simply counting the number of returns with any pass-through business income. So, if somebody makes a little money selling products on eBay and reports that income on Schedule C of their tax return, they are counted as a small business. The fact that there are millions of people in the lower tax brackets with small amounts of business income may be interesting for some purposes, but it is irrelevant for the assessment of the economic impact of the tax hikes. The numbers are clear. According to IRS data, fully 48% of the net income of sole proprietorships, partnerships, and S corporations reported on tax returns went to households with incomes above $200,000 in 2007. That's the number to look at, not the 3%. Would Mrs. Pelosi and Mr. Biden deny that the more successful firms owned by individuals in the top income-tax bracket are disproportionately responsible for investment and job creation? One of my Harvard colleagues recommends this critique. 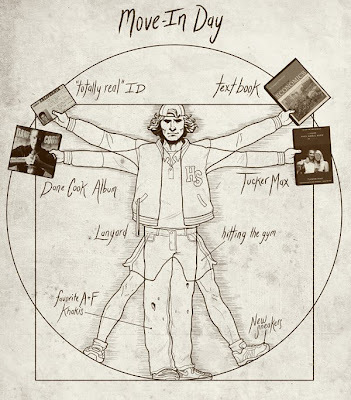 Check out his choice of textbook. Here is Christy Romer's farewell speech.